Just a quick pictorial guide on an easy repairing for a Sanyo DP50747 chassis P50747-03. The TV would start up fine with sound, but nothing on the screen. 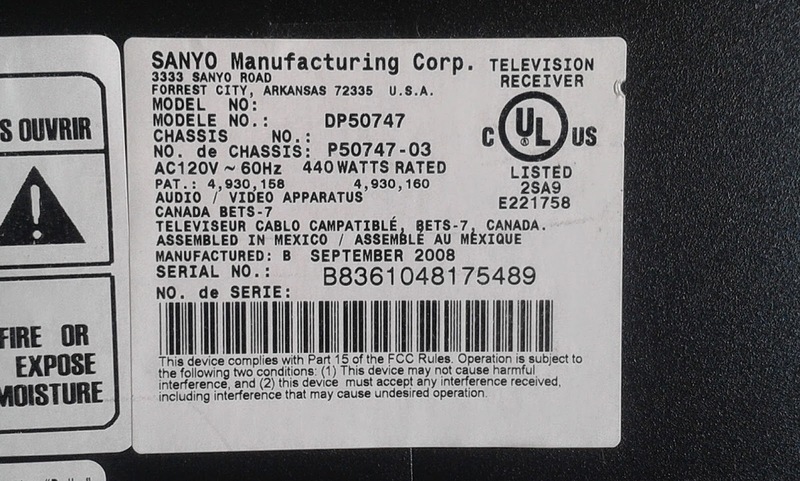 A quick reminder before proceeding: with Sanyo TVs (as well as some others) the model alone is NOT a unique identified. There are 7 or 8 DP50747 models that I know of, specifically P50747-00 to P50747-07 and they have very different internals and very different failures. What's discussed here does NOT apply to other versions of DP50747, but would apply to other 50'' TVs based on the Samsung plasma display used in DP50747-03 as it would come with the same sustain boards that are used in DP50747 with chassis P50747-03. Taking the back cover off is a fairly straightforward task, so no details about it. First we made sure that the sustain voltages are properly produced by the power supply and passed to both sustain boards. 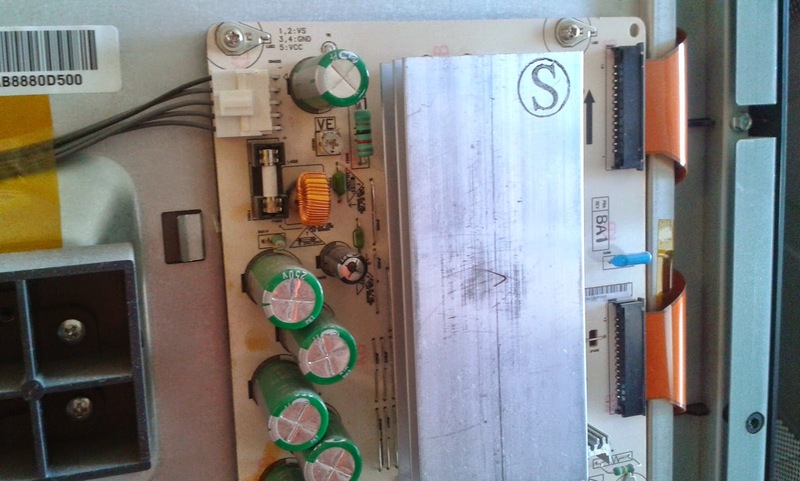 If Vs was out of range the power supply itself would have shut the TV and the bare fact that it was holding was sufficient indication that the problem wasn't there, but since power supply board PS-W3 is known to develop some issues we checked it nonetheless. As expected it was there. So then we ran a quick test on the power components and fuses on the YSUS board (which also contains the buffer register outputs) and everything checked out. 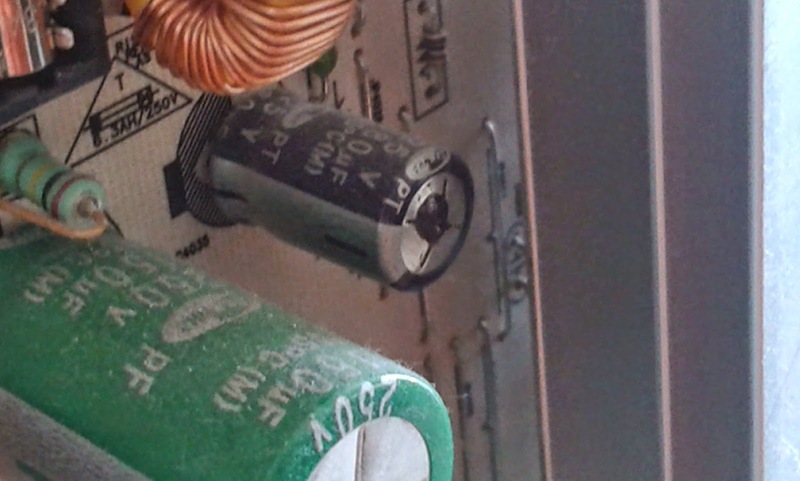 In case it is not clear there is an electrolytic capacitor with bulged and even cracked top out of which some electrolyte has spilled. This is a relatively rare problem in sustain boards in our experience, but as manufacturers kept on polishing other components and ran away from the hybrid ICs used in the second and third generation plasmas it is not unlikely to start seeing more of such issues as others get phased out, much like with the power supply boards. Anyway, when an electrolytic capacitor starts failing like that its resistance starts lowering and it often causes excessive current in the circuit where it's supposed to filter ripple , working as a low resistance load as opposed to backup energy source. As a result, the fuse in the circuit (if there's a fuse) often times fails and that was the case here as well. 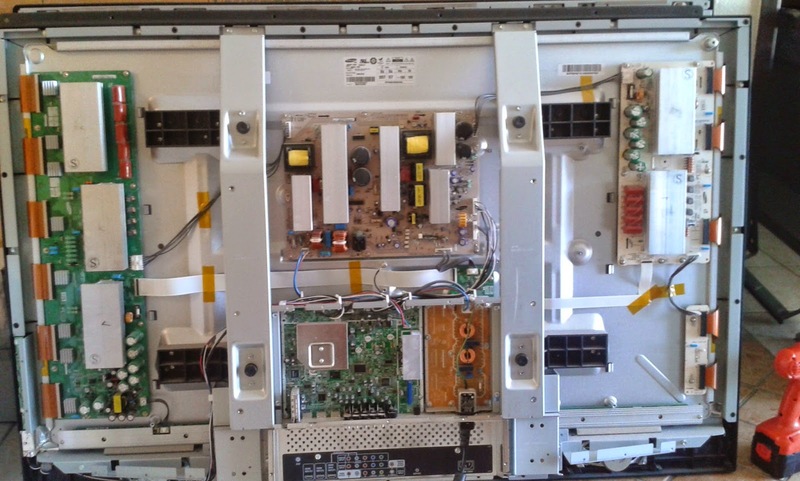 Replacing the fuse and the capacitor took care of our TV.